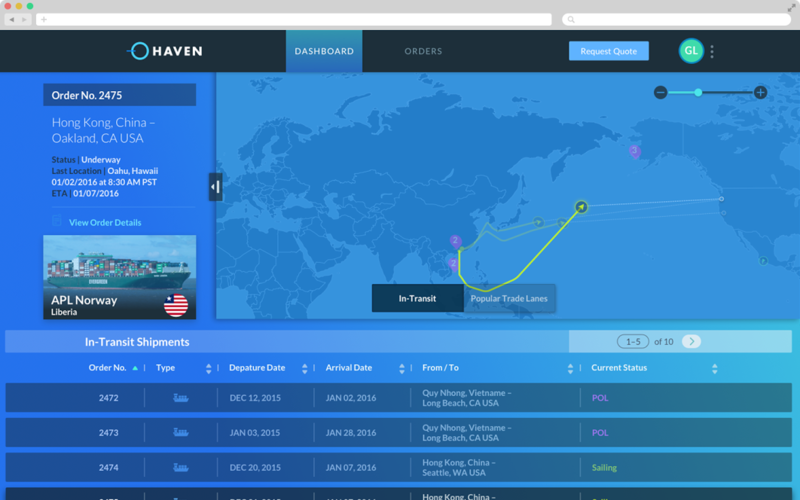 Interview with Matthew Tillman, CEO of Haven Inc, an automated platform for quoting, booking, and tracking shipments. Haven is a Singapore and San Francisco-based logistics platform built specifically to solve commodity trader’s biggest challenges through automation. We enable with the world’s largest trading firms to lower costs and increase margins through technology. Our system provides everything you need to take control of logistics including automated procurement, documentation, tracking, and payments. Unlike a forwarder, Haven is built for shippers which means we never add hidden margin, are provider independent, and fully transparent. In 50 words or less tell us about your business. How/why did you start HAVEN? Global trade depends entirely on logistics which is still bought and sold by middlemen using telephones and fax machines. Haven believes that an efficient global supply chain improves everyone’s quality of life. You just raised a Series A round of $11 million. What’s the most challenging thing about attracting investors? Attracting investors isn’t difficult if you have a great product in a large market (logistics is a $1.6T+ business). Haven focused on getting the right set of investors which is the real challenge. We recruited ours just like you would recruit executive talent. Haven and it’s investors are aligned and each offers a compliment to the other in a particular area of expertise such as technology, finance, and sales. We couldn’t have a better group of investors (Spark, AITV, DataCollective, First Round, OATV, etc) onboard. It’s great fun as an entrepreneur to work with the people behind successes such as Google, Facebook, Twitter, Uber, etc on a regular basis. Many Haven employees have families so it’s important that we don’t fall victim to the same work habits of the traditional startup. Everyone that works at Haven is in service of our customer so while we don’t set mandatory hours or limit vacation days, our customers take priority. I love the fact that Haven solves real world problems and not first-world problems. Our customers ship real products such as metal, food, and rubber. To be even a small part of getting people the food they eat is an honor. The look on a supply chain manager’s face the first time they hear about our product. No one expects a completely transparent, honest, high tech company to be servicing the logistics industry. On more than one occasion a customer has asked if they could join the company after seeing the product. That’s always memorable and very gratifying. In 5 years, Haven will have helped millions of people feed their families thanks to the transparency our platform brings to the market. It’s small but growing. Even with all the capital available, Asian investor’s attitude towards risk has played a huge role in holding local entrepreneurs back. Thankfully we’re starting to see that change. Teams are beginning to take more ambitious risks in larger markets using Singapore (and HK for that matter) as a base of operations. Many of the products are simply less creative versions of Silicon Valley based startups but I’m excited to see some teams developing more of their own identities by focusing on their customers and not what investors want. My biggest piece of advice to all Asian startups: raising money is not the goal, it’s customer satisfaction. For our customers, we are the only technology company in logistics that’s fully transparent, provider neutral, and capable of end-to-end shipments. For consumers, nearly everything you eat, wear, or use on a daily basis came from a shipping container and Haven gets them to you faster, cheaper, and free from corruption.